Lately I've been craving pasta. Usually I like to be difficult, and I crave fresh, handmade pasta, but this time, I'm simply craving some dried, boxed pasta. I can't even remember the last time I bought a box of rigatoni or penne. When I picked some up from the grocery store today, hearing the hard pasta rattling around in the box instantly brought back memories. The first meal I ever cooked from start to finish on my own was back in high school. It was Mother's Day and I wanted to surprise my mom with lunch. I followed Ina Garten's recipe for linguine with shrimp scampi exactly. Simply boiling the pasta and making the lemon butter sauce simultaneously was almost too much for me to handle, but from then one, if I announced I was making dinner, you can bet it involved some pasta dish. My first taste of fresh pasta was at Bartolotta in the Wynn Las Vegas. I remember falling in love with the texture and wondering why all pasta couldn't taste like that. Once I got the pasta extruder attachment for my stand mixer, I became a pasta extruding machine. If I was going to make a pasta dish, it had to be made with fresh pasta. For a while, all I did was extrude rigatoni and make bolognese sauce. So really, now that I'm thinking about it, I don't think I've touched a box of dried pasta since I got that pasta extruder over a year ago. Tonight, I tried to work some magic with little pieces of dried orecchiette. 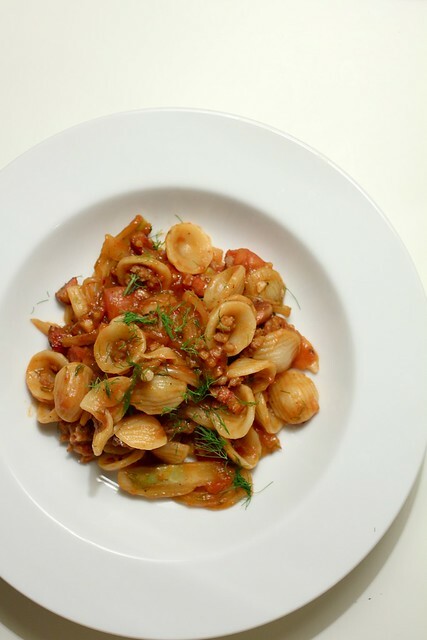 Italian for "little ear,"orecchiette might possibly be my favorite pasta shape. I love the extra chew that comes from the little dimpled shape. 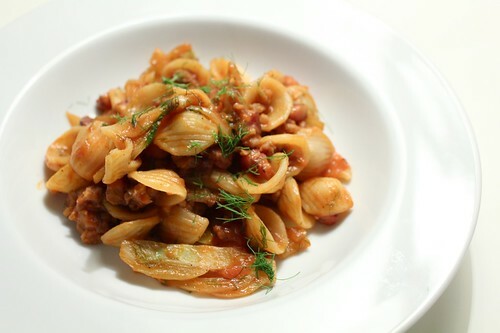 Orecchiette always seems to be served with sausage, sausage reminds me of fennel, and I love fennel. So, Voila. 2. Add onion and garlic and cook until translucent but be careful not to burn the garlic. Add a sprinkling of crushed red pepper and fennel seeds. Toast the spices a little in the oil to make them fragrant. 3. Remove sausage from casing and add to the pan. Break it into pieces and cook until browned. 4. Add in thinly sliced fennel and cook until barely translucent. 5. Add tomato paste and chunks of fresh tomato. Cook until the liquid from the fresh tomato has evaporated then deglaze the pan with a splash of white wine. 6. Adjust seasoning with salt and pepper. Finish with fennel fronds. 7. After the dried pasta has cooked for the recommended amount of time on the box, drain and add directly into the sauce. Keep the sauce and pasta on the stove for a few minutes to let the sauce really soak into the pasta.